Wakulla County doesn’t have a giant Ferris wheel. No bungee jump. It has a marine park, of sorts, known as Apalachee Bay, which, depending on the weather, may become a wave pool. Its favorite swimming pool is spring fed. Fully 75 percent of the land that makes up the county is public. Vacationers seeking a mellow getaway. Travelers who move through Wakulla County to other destinations. “If you’re in west Georgia or east Alabama, and you want to come to the coast, we actually provide the closest access to the marine environment,” Moody noted. The activities of the TDC are funded, after all, by a 4-percent tourist development tax (or bed tax) collected on the county’s behalf by the state Department of Revenue. For the period July 2017 through June 2018, bed tax collections totaled $163,548. The TDC works with a Jacksonville firm, Connect Agency, that promotes the county primarily via social media, Moody said. In addition, the county has marketed to group tour businesses and has made billboard, magazine and radio advertising buys. For the potential visitor, the county has put together recommended itineraries that include eateries such as the Seineyard Restaurant in Woodville, Angelo & Son’s Seafood Restaurant in Panacea and Posey’s Up the Creek Steam Room, also in Panacea. Countywide visitation steadily increased from 2013 through 2016, growing by as much as 12 percent in a year. It now appears to be leveling off, said Moody, who believes that the county may need to identify new markets to penetrate. And the county does have two parks, one state and one national, that serve as its biggest tourism draws. Moody is intimately familiar with the St. Marks National Wildlife Refuge, where he works as a public use officer, answering visitors’ questions and coordinating the work of volunteers. The refuge is a magnet for saltwater ducks, including redheads and scaups, and various puddle ducks, particularly during migratory periods. Moody estimated that 25 species of ducks visit the park, making it a mecca for birdwatchers. Indeed, the TDC has placed ads in a niche publication, Bird Watcher’s Digest. Many waterfowl overwinter at the park. The refuge is well known as a stopping off point for migrating monarch butterflies and, in fact, sponsors an initiative that encourages people to plant milkweed as a way to rebuild monarch numbers, which have plummeted since 1990. Monarchs lay their eggs on milkweed, the sole source of food for monarch caterpillars. The fall monarch migration is celebrated with a festival each October; it includes a monarch tagging activity and coincides with the St. Marks Stone Crab Festival. The refuge, according to Moody, attracts about 300,000 visitors annually in addition to folks who just drive through. Moody distinguishes Wakulla Springs State Park from the refuge given its relative richness in human history and its renowned swimming area. The park, boasts its website, is home to the world’s largest and deepest freshwater springs, where manatees, alligators and other diverse wildlife are known to play. The park’s riverboats and its diving platform both make for excellent wildlife viewing towers. The spring’s gin-clear water is 70 degrees year-round, making for invigorating plunges. The Wakulla Springs Lodge, developed in the 1930s by the park’s businessman namesake, is an elegant reminder of the “Real Florida,” and overlooks cypress swamps where old Hollywood movies including “Tarzan’s Secret Treasure” (1941) and “Creature from the Black Lagoon” (1954) were filmed. Listed on the National Register of Historic Places, the lodge features 27 guest rooms, each with a spacious marble bathroom, walk-in closet, and antique or period furniture. All rooms have a telephone, but no televisions, making for quiet and relaxing stays. The Ball Room Restaurant, located on the ground floor, overlooks the spring and features modern and Southern cuisine. Today, visitors swim where mastodons once bathed and take guided boat tours across waters once traversed by native peoples in dugout canoes. Fort St. Marks was added as a national historic landmark to the U.S. National Register of Historic Places in 1966. Certainly, it had enough history to qualify. Today, the fort’s remains are at the center of a state park. The Spanish were the first to build a fortified structure at the site, known to them as San Marcos de Apalache, at a time when they were expanding their presence in Northwest Florida. Strategically, they erected a stockade near the confluence of the Wakulla and St. Marks rivers in 1679. For years, it remained an outpost. Finally, in the 1730s, a small community grew up around the stockade, and the fort was expanded with the addition of a second wooden building in 1753. The installation wouldn’t last long in its wooden form before it was wiped out by a hurricane. In 1759, the Spanish built a stone fort, designed to resist bombardment by ships and storms. They abandoned it to Indians for use as a trading post after ceding Florida lands to the British following the defeat of France in the French and Indian War. Following the American Revolutionary War, the British traded territory with Spain, which took over West and East Florida again. 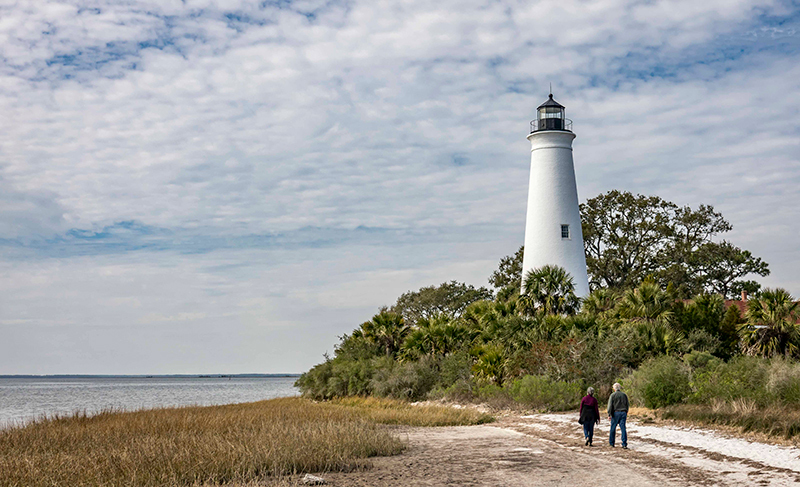 St. Marks was in East Florida; the boundary was the Apalachicola River. Spanish forces reoccupied the San Marcos fort in 1783 and strengthened its defenses. Andrew Jackson, then involved in the Seminole Wars, had his forces seize the fort in 1818. The U.S. occupied it for nearly a year. The Fort St. Marks military cemetery was established at that time for the burial of men who died at the garrison. In 1821, the United States purchased Spain’s Florida lands, including the fort site. In 1839, during Florida’s period as a U.S. territory, the federal government built a marine hospital at the site, using stones and other materials from the old fort. During the Civil War, the Confederate army took over the fort after Florida seceded from the Union. U.S. forces regained control of the site in 1865, the last year of the war. Remains of the stone fort remain in evidence at the site. A museum and visitors center have been built on the foundation of the old hospital. A stone well and a retaining wall have been reconstructed nearby, based on archeological documentation. San Marcos de Apalache Historic State Park is located off State 363 at 148 Old Fort Road. Online reviewers have written favorably about the park’s orientation movie, “classy museum,” knowledgeable staff and river views. Florida’s stone crab fishery may be the state’s most unusual. When the crabs are secured, either in baited traps or a diver’s hand, only a claw is harvested and the living crab is released. The approach takes advantage of the stone crab’s ability to regenerate a lost claw every time it molts. So it is that claw consumers might not feel as guilty as someone sitting down to a whole snapper. The Wakulla County TDC makes a targeted effort to attract seafood eaters, and there may be no local seafood more enticing than the meat of a stone crab — white, flaky and sweet. At the St. Marks Stone Crab Festival, folks take seats at long tables beneath tents and whack at the claws with a length of wooden dowel until they are breached, revealing the delicacy inside. Friendly competitions develop among people who strive to extract the largest piece of meat from the black-tipped orange appendages. The claws are powerful enough to attract not just crab eaters, but also musicians and sellers of custom jewelry, handcrafted furniture and other unique items. Festival proceeds are donated to local charities. The event is held each October. Thirty-two years after it was established in 1963, the Gulf Specimen Marine Laboratory in Panacea expanded its mission to include an emphasis on education, which is delivered via programs for schools, an aquarium and public visitation. “Giving people an appreciation for the diversity of life in the sea and a desire to protect it is our primary mission,” said the lab’s founder and managing director, Jack Rudloe. Doing so involves touch tanks and exhibits that enable students and other visitors to feel, smell and hear odd and interesting creatures of the Gulf of Mexico. The lab helps cover the cost of aquarium maintenance by selling diverse living marine life from the Gulf of Mexico to schools, universities and research laboratories. That service, said Rudloe, is essential to researchers all over the United States in many fields of science. More than a hundred school groups and over 20,000 individuals visit the aquarium each year and view hundreds of species of local invertebrates, fish and algae as well as sharks and sea turtles from the Gulf of Mexico. Exhibits are ever changing. The biological supply operation provides a constant flow of animals coming through the lab.